Led by Music Director Christoph Eschenbach, the National Symphony Orchestra regularly participates in events of national and international importance, including performances for state occasions, presidential inaugurations, and official holiday celebrations. Through its tours of four continents and performances for heads of state, the National Symphony also fills an important international role. Officially founded in 1931, throughout its history the Orchestra has been committed to both artistic excellence and music education. 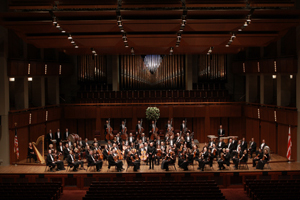 In 1986 the National Symphony became the artistic affiliate of The John F. Kennedy Center for the Performing Arts, the nation's center for the performing arts, where it has presented a concert season annually since the Center opened in 1971. The Orchestra itself numbers 100 musicians, presenting a 52- week season of approximately 175 concerts each year. These include classical subscription series, pops concerts, and one of the country's most extensive educational programs. The National Symphony Orchestra has a strong commitment to the development of America's artistic resources. Through the John and June Hechinger Commissioning Fund for New Orchestral Works, the Orchestra has commissioned more than 60 works, including cycles of fanfares and encores, which, taken as a whole, are representative of the diverse influences in American composition today. The National Symphony has long been distinguished for its nurturing of young American conductors. Another important project is the National Symphony Orchestra American Residencies for the John F. Kennedy Center for the Performing Arts, which has so far taken the NSO to 20 states. This venture encompasses sharing all elements of classical symphonic music with a specific state, exploring its diversity of musical influences, and giving the state a musical voice in the nation's center for the performing arts through exchanges, training programs, and commissions. Throughout its history, the National Symphony Orchestra has served the nation through tours, broadcasts, and other special projects.